Since its foundation in Japan in 1924, Tsurumi Manufacturing Co., Ltd. has been engaged in the manufacture, supply and sales of various pumps including submersible pumps as key products, environmental devices and related equipment. This time, two 15 kW models have been added to Tsurumi's flagship KTZ-series of submersible pumps which support a product lineup of models ranging from 1.5 to 11 kW. The new models are available in two types: KTZ415 (4-inch) and KTZ615 (6-inch). 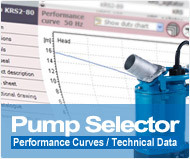 These pumps provide a maximum head of 55 m and maximum capacity of 2.8 m3/min. Built with a cast iron body and high-chromium cast iron impeller, these pumps are advantageous in terms of durability and wear resistance. As the discharge design of these pumps, a top discharge side flow structure is used, which enables the slim body to be installed in a confined space and also ensures extended operation at a low water level. Owing to these features, the KTZ-series qualify as heavy-duty, highly-reliable and continuous duty pumps that are suitable for harsh work environments such as mining, quarrying, construction and tunnel work sites. Also, the Tsurumi's original (design registered) multi-directional hose coupling structure enables flexible on-site setup for either vertical or inclined discharge with just a wrench. Like all general submersible pumps from Tsurumi, these pumps are equipped with an anti-wicking cable, motor protector, dual inside mechanical seals with silicon carbide faces, and Oil Lifter as standard equipment. Furthermore, as found on 7.5 kW and higher motor output models of the KTZ-series, the 15 kW models have seal pressure relief ports in the pump unit, which prevent pump pressure from being applied to mechanical seals. In developing the new models, KTZ 15 kW, double bearings were provided at the bottom, as a thorough countermeasure against thrust load that may become a major factor of a pump fault. The shaft has undergone quenching treatment to increase hardness and ensure stability. These features are the results of original technologies and unmatched know-how that Tsurumi has cultivated over years of manufacturing pumps for construction purposes, so we firmly believe that you can assuredly use our pumps. In addition to these pumps, Tsurumi offers a variety of pumps with excellent reliability and durability that can withstand harsh work conditions. To place an order, please contact us.